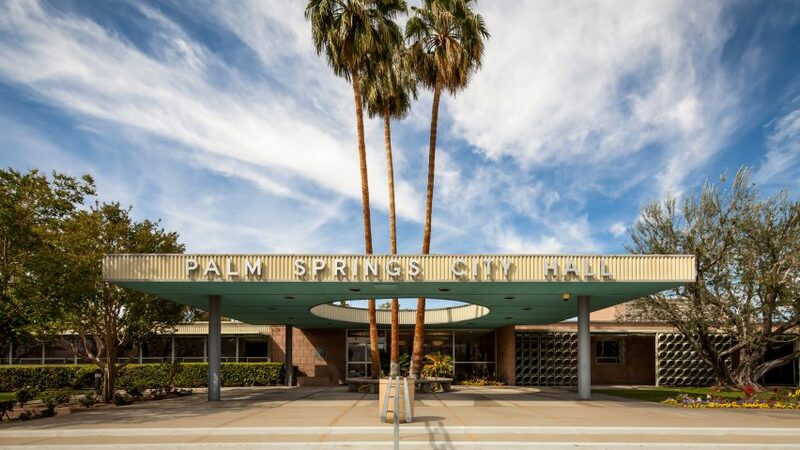 Our series covering modernist architecture in Palm Springs continues with the city's municipal building, designed by Swiss architect Albert Frey to include large canopies over its entrances – one with palm trees growing through its centre. 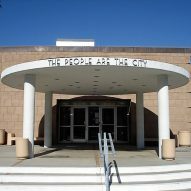 Frey – who was prolific in the city – completed the Palm Springs City Hall in 1952, in the modernist style popular of the location and era. Like many of his designs, the building is integrated into the surrounding terrain. Its outdoor walkways appeal to the sunny, arid climate suitable for outdoor spaces, while landscaping includes sections of grassy lawns with flower beds and mature trees. The low-lying structure is organised around its main entrance, where a flat roof covered with corrugated metal extends from the doorway. Painted pale turquoise underneath and yellow around the sides, this expansive canopy creates a shaded area for approaching visitors on the sun-drenched south facade. A giant hole in the centre of the entrance canopy allows a group of three palm trees to grow up through, around the base of which are curved benches. Embossed lettering spells out the building's name on the front of the portico. A secondary entrance to the right is also protected by a canopy. This one is circular – as if cut out from the first – supported by four cylindrical pillars, and painted white. A motto that reads "The people are the city" wraps around its front, taken from act three, scene one of William Shakespeare's play Coriolanus. Frey drew from the local area when selecting colours and textures for the project. The exterior facade is a light taupe hue to match the desert beyond. The aqua colour on the main porches was selected to deter birds from building nests, as it resembles the sky, and can similarly be found on homes in Florida's Key West for the same reason. Colonnades around the perimeter create partially enclosed walkways. 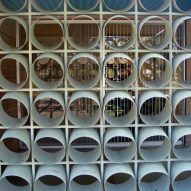 Panels formed from grids of white tube sections allow air to pass into these paths while shading them from strong sunlight. Born in Switzerland in 1903, Frey began his architecture career in Belgium, before moving to Paris to work for Le Corbusier. While at the famed architect's atelier, Frey contributed to many significant modernist buildings including the iconic Villa Savoye. Soon after, he left to work in the United States. During a spell in New York City, Frey designed the ready-to-assemble Aluminaire House in 1931, which was recently moved from the East Coast to Palm Springs and assembled in a local park. In 1939, Frey moved to California and worked with American architect John Porter Clark for almost twenty years. 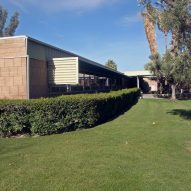 He later collaborated with Robson Chambers on the Tramway Gas Station, which now serves as Palm Springs Visitors Center, and completed a variety of private residences in the city. Palm Springs celebrates its architectural pedigree during the annual Modernism Week, taking place this year from 15 to 25 February 2018. To coincide, we're profiling some of its best buildings, including E Stewart Williams' Twin Palms estate, John Lautner's Elrod House and Richard Neutra's Kaufmann House. Photography is by Darren Bradley unless stated otherwise.